I admit to loving mason jars. 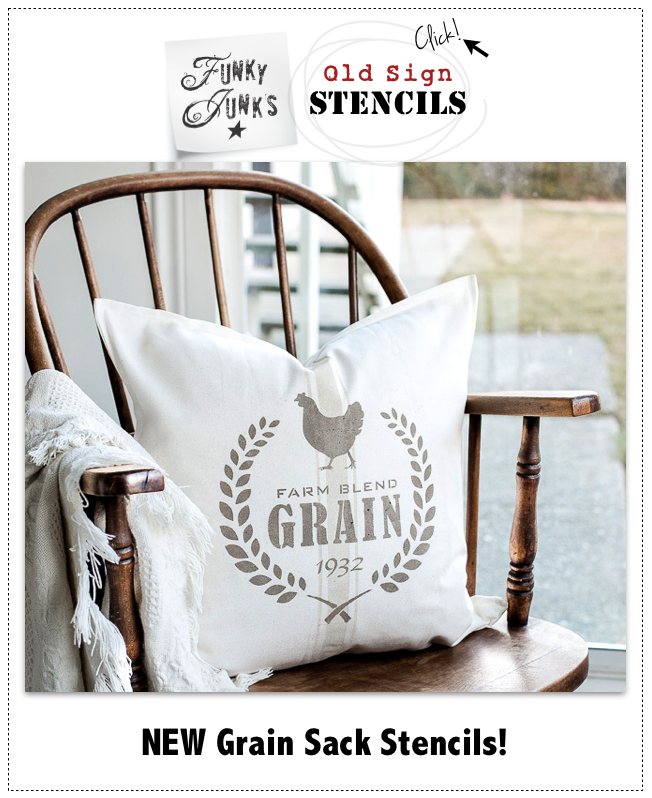 They are the perfect vintage inspired container for soooo many things. My preference is to not really crafting them up, but rather keeping them to look like their elegant authentic selves. Here are a few quirky things I’ve done with them. Take advantage of that see through glass and have fun with filling them up. Placing a grouping in a crate not only adds weight to your centrepiece, it can act as a tray to move your arrangement around. 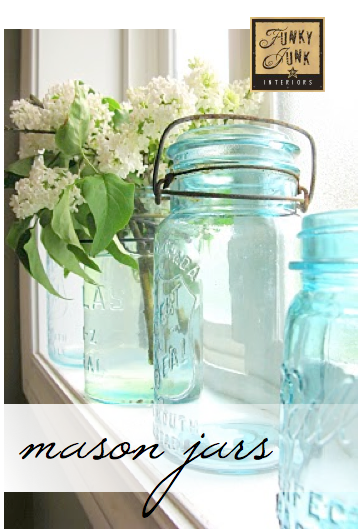 Aqua mason jars look incredible in front of sun filled windows. They positively illuminate, battery free! If flower stems are too short for the jar, tie them up, which also adds extra detail. Groupings add punch! Disperse that height and try bright flowers to contrast with bright jars. They look very pretty as stand alones too. 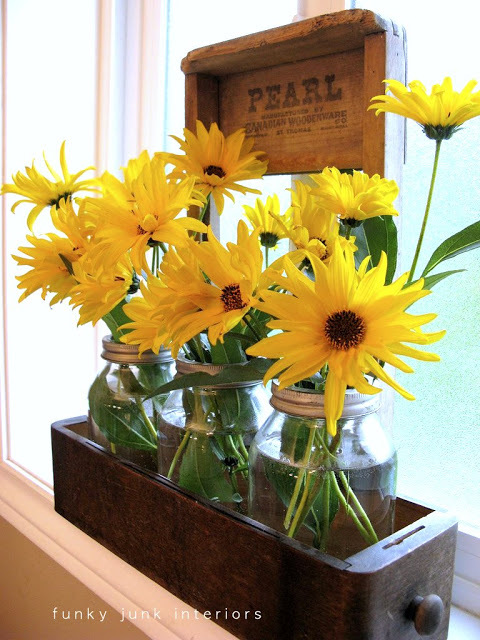 A group of 3 mason jars inside an antique sewing drawer creates a great base for bright yellow blooms. Extra quirk – the mini washboard lost it’s centre, so it added additional height without losing light. Here are some candle filled mason jars sitting on a window sill. 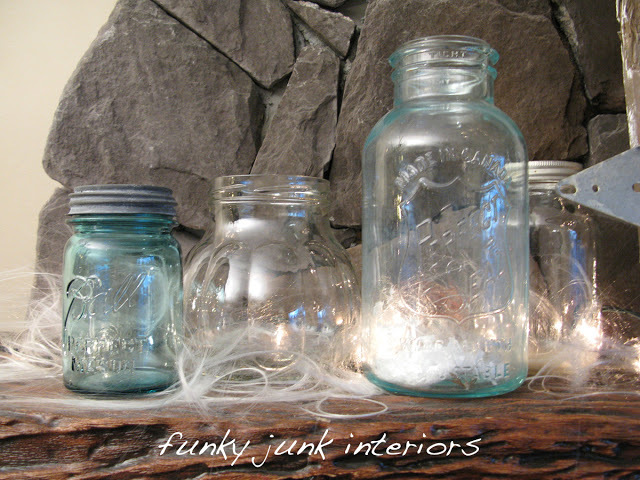 One of my favourite things to do with mason jars is to illuminate them. Once jars are in place, mini lights are hidden behind and under the faux snow, which had all the jars positively glowing. Even a home office can bonus with a few jars around. Note I placed these in front of sunlight once again. So that’s where I put my glasses… ok then! This windowsill looked awesome all lit up with candles inside the jars. And when Christmas arrived, I added abit of faux snow inside. 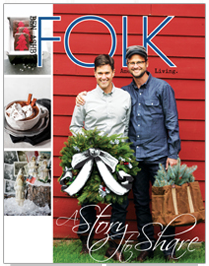 And just for fun, here’s 185 linkups to a mason jar party from the past. 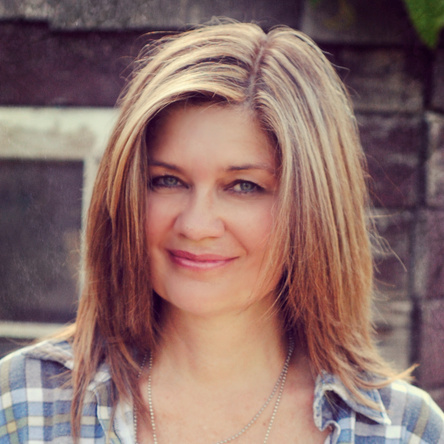 Is there anything a mason jar CAN’T do?! How do you like using mason jars? Oh how we love mason jars around here! My husband collects those and I collect old soda bottles. There are just so many things you can do with them!! I love all of your ideas, Donna. I love all of your ideas, unfortunatley, I don’t have those awesome windowsills that you do. Wahhh! you have lovely ideas! 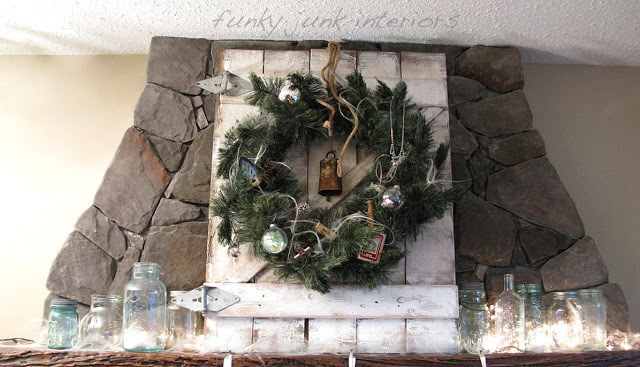 love the mantel, thanks for sharing. I love mason jars too, but recently grabbed a few when I was painting. I’ll have to get them really clean now and not use them for painting again. I love the way you paired them with the old bottle in the crate. 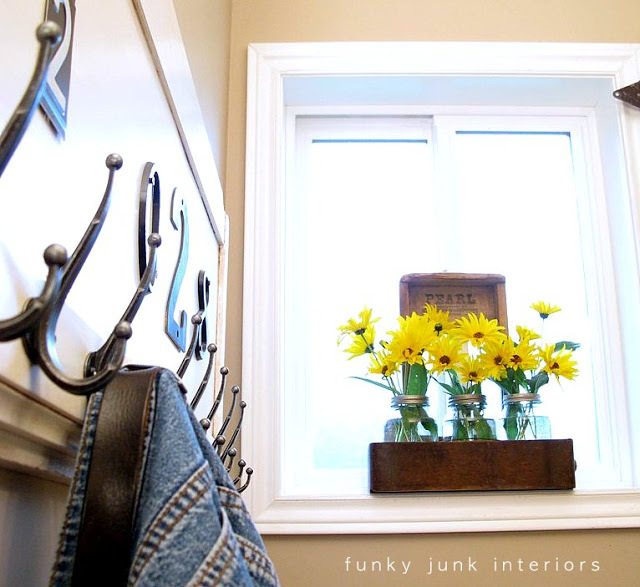 You use ‘junk’ (treasures to some of us) in the most inspiring ways. That’s why we loooove your Funky Junk! Love all the mason jars as you have displayed them. I also have some and hope we can do a SNS on mason jars. Have a great week. Hugs. I’m with you. Love mason jars! I also love how you tied the short stems with the twine floating below. Great picture! Looking great, loving the pretty flowers! 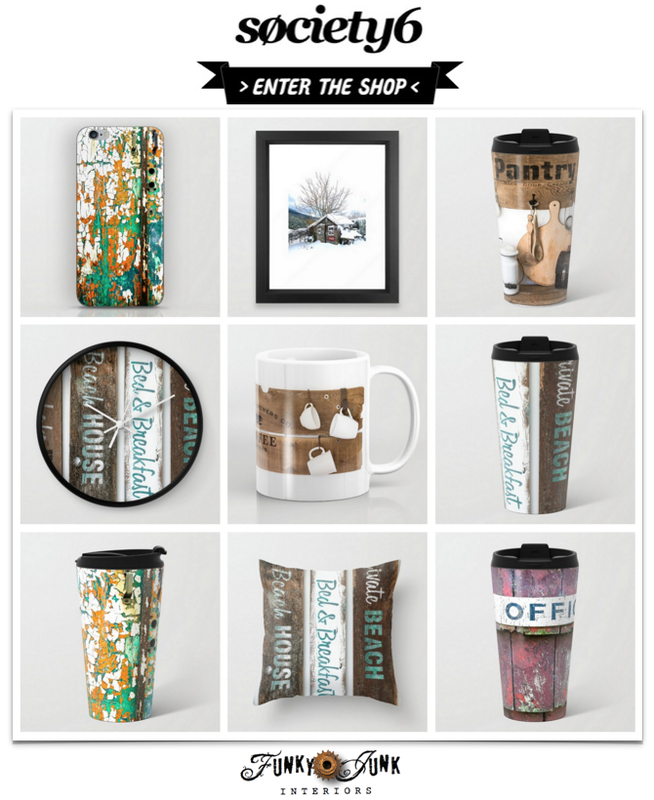 Donna–although I’m not really into the bottles and jars, YOUR PHOTOGRAPHY and sense of composition is SO BEAUTIFUL–I can totally see their beauty. If you aren’t already, you should sell your photos! My big brother has an incredible eye for landscape photography and has sold some of his for calendars, and to offices and hospitals all over! Perfect timing!! I just bought to LARGE jars with lids last weekend!! I am addicted to mason jars, I have a collection of them to store sand and seashells from every beach we have visited. I serve desserts in smaller ones. Layered ones look best like shortbread, fresh peaches, raspberries w a berry sauce, ice cream and maple vanilla whip cream. Your mantel is GORGEOUS! And I love your use of light accents from the mini lights and the sunlight! I also have a crush on mason jars, although I do not have any aqua ones. 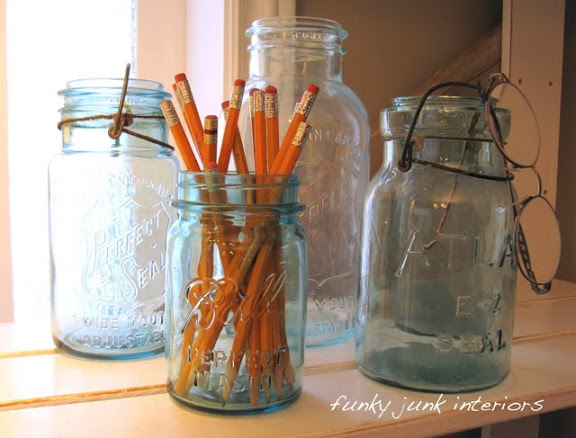 Great collection of quirky Mason jar projects here. I never throw away any jars as they are just so useful. I use them for flowers, storing craft nik-naks, nuts, bolts, the list goes on. I even have a few terrariums using jars and these make such a nice addition to my home. Very nice photography, where can i find jars like this for my own house. 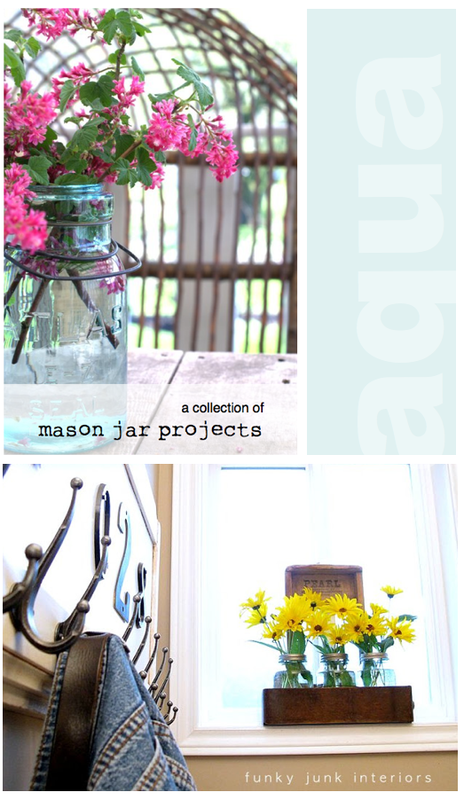 I must confess to stealing some of my MIL Mason jars collection… but they’re just so pretty! Did I tell you I love this blog???! This is wonderful. I also have a collection of mason jars but I haven’t tried this much of lovely creations. Your designs are very creative and I have got some new ideas from your pictures.